Congratulations and we are excited to walk the adventure with you! Below, images of the Church which seats up to 400 people. Call the Office at 316.684.6896 to schedule a meeting with one of the priests. A. At the first meeting, couple will work to complete the discovery form, which is a guide to streamline the Marriage preparation process, particularly if their are any dispensations or need to send marriage preparation documentation to another diocese. B. Go over the universal, diocesan requirements: these are considered the basics and pillars of the marriage prep program, and usually indispensable as the they are mandated. However, should any problem arise in completing or beginning one of these universal requirements, please contact the Pastor as soon as possible. II. Engaged Encounter ($225 per couple, weekend at Spiritual Life Center). Click Here to Learn More and to Sign Up of the Weekend. They are held at least at 2 weekends per month to accommodate schedules. III. Generally, each couple will fulfill the theological preparation requirement through meeting 3 times with the Priest and participation in the Humanum Video Series and Worksheet (Trailer below) . Meeting II is to go through Prepare and Enrich Inventory together, discuss the progress of requirements, places any certificates of completion: such as the Engaged Encounter weekend. Meeting III is usually the final meeting before the wedding, to approve wedding program or booklet, plan Liturgy, final preparation and ensuring that the couple has obtained civil marriage license and complete pre-nuptial file; and place the completed worksheet for the Humanum Series in file, along with Prepare and Enrich, Engaged Encounter, and Meeting with Mentor Couple. The Church understands the family to be the fundamental cell of society, as Pope St. John Paul II said, "As the family, so to the society." And so, the Church takes very seriously her role to assist Married couples, to prepare them for living the Sacrament of Marriage, and to be an Icon of the Trinity in the world through their total self-donation. **At St. Paul, we feel The Humanum Series helps couples to better understand the theological underpinnings of the Sacrament. (Trailer can be seen on this page, it is an amazingly short and informative video series). There is a common misunderstanding among some of the lay faithful, that both the bride and groom have to be Catholic to have a "Catholic Wedding". So many people have experienced a anxiety over this unfortunate assumption that it merited a clarification in this section on marriage. It is absolutely and patently false that both parties have to be Catholic to have a Catholic Wedding (that is, to have a marriage blessed and recognized by the Church). It is sometimes a thoughtful suggestion to encourage a couple of mixed religion to have a Liturgy of the Word Wedding (or Nuptial Rite celebrated outside of Mass), but this is not an hard and fast rule. 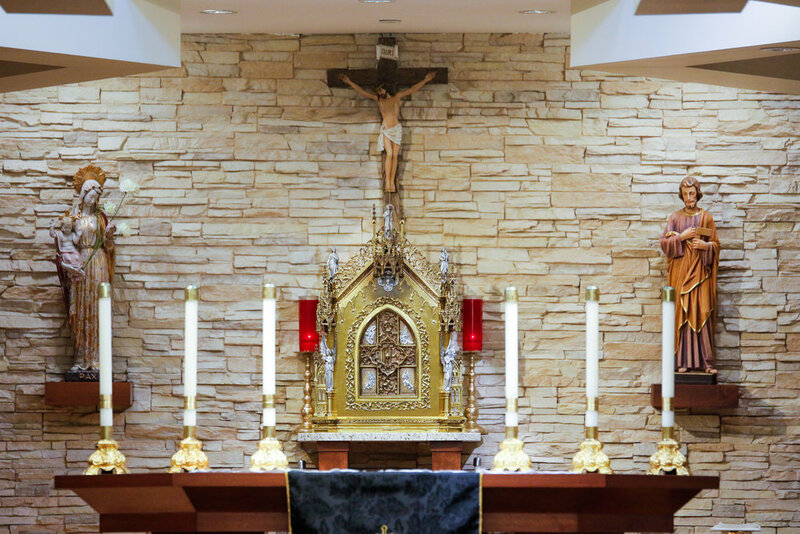 Since the wedding day is the bringing of two into one, as Jesus speaks of Marriage, it seems that it might be advisable to celebrate the wedding outside of Mass when both the bride and groom cannot receive Communion together. At St. Paul, deciding whether to have a Nuptial Mass or Nuptial Rite outside of Mass is a matter of discussion, formed in dialogue with the Priest and the Couple and (and if the wedding is not at St. Paul, it's advisable to bring into the dialogue the Priest at the Parish where the wedding will take place).